I know I generally write about all things food but this week I wanted to share something a little different with you. Some time ago I saw a book called Letters of Note raising funding to be published through Unbound. This compilation of letters from across the world and throughout history was such a fabulous insight into many wonders. Not only was the content moving, funny, inspiring and stimulating, but also seeing the actual handwriting and letterheads connected you to that time in a way that we have lost in this modern era of snapshot bulletpoints and arial font typing. So I subscribed and helped in a very tiny way to get this masterpiece published. Set in the impressive, art deco Freemasons Hall in London, the concept began three years ago and has gone from strength to strength. Bubbledogs provide the catering, and there are papers donated by Monoset so that you can write a letter there and then which will be posted anywhere in the world by the team on the night. Money is also raised for literacy charities. Hearing a letter read out loud brings a different dimension to it anyway and when you add in some of our most impressive actors to take the helm, the result is just magical. You don’t know when you arrive who is going to read and what letters are going to be shared but there is a sense that whatever the combination is going to be, it will be a good one. The presenters for us were Toby Jones, Stephen Mangan, Tobias Menzies, Louise Brealey, Jarvis Cocker, Karen Dotrice and the inimitable Miriam Margolyes. They presented individually or together as each letter dictated and brought each character to life putting you right in the moment that it was written. From Napoleon to his beloved Josephine to a letter written this year by US presidential advisors putting forward a case why Donald Trump should not be elected president, there was something for everyone. When do you get the chance to journey in one night through the lives of Winston Churchill, Basil Rathbone, Iggy Pop, Tom Hanks as a kid, an Elvis fan, Rolling Stone, Che Guevara, Star Trek’s casting notes, MGM to Disney, Billy Connolly, JK Rowling and a particularly wonderful complaint letter to Continental airlines, plus a few more in between. Topped and tailed by new musical talent, the star of the show for me was Ms Margolyes. Not only is her diction, intonation and general presence so impressive, but her timing is just fabulous. With one look she brought the house down. She is quite incredible. So if you get the chance, go! and go again. I am sure each session will bring a different dimension and as one who had that inspiration, it just remains for me to bring back the art of writing letters. I vow to write one every month. This is a new addition for my 50 at 50 ambition – more of that in due course. When Yotam Ottolenghi burst onto the food scene in the late 1990’s with Sami Tamimi it seemed that they would finally put Middle Eastern food onto the map in a modern contemporary way. Sure enough, their cookbooks, restaurants and style of food captured the British imagination finding just the right balance of flavours and styles that embraced but didn’t frighten off. We suddenly added pomegranate molasses to our store cupboards and for over a decade they were still owning that stage solo. In 2013 came class of Ottolenghi in the form of Sarit Packer and husband Itamar Srulovich at the tiny, but always busy Honey & Co. This couple seemed to build on the Ottolenghi formula with more heart and passion but still understated and easy to relate to. Traditional pastries like babka sat alongside sweet, spiced, fruity dishes and suddenly we were re-evaluating those Middle Eastern flavours again. 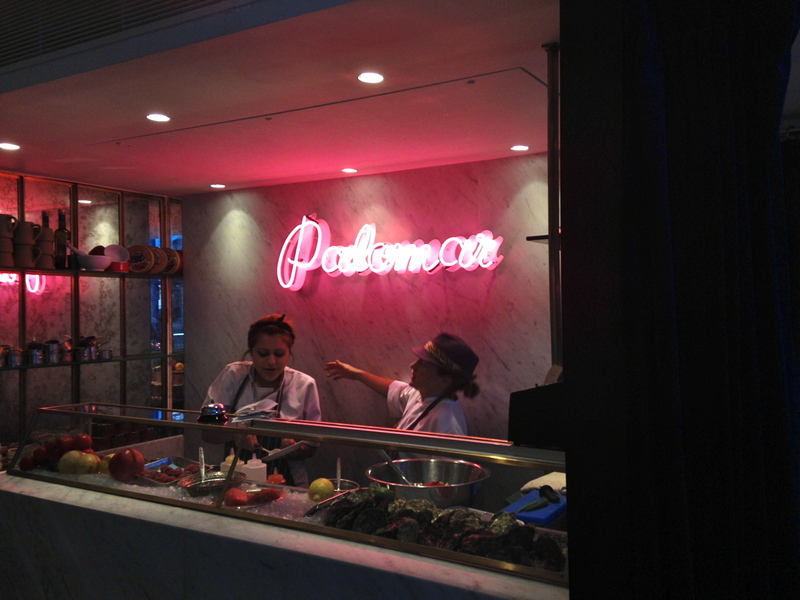 Then came The Palomar. This team from Machneyuda, Jerusalem, brought the true vibrancy and energy that permeates an eating experience to the street of London. Many worried about its reputation for being more nightclub than restaurant but the truth is that the food spoke for itself. Finally we were moving on from felafel and kebabs and presenting food that had the colour, energy, flavour and excitement that should be coming from such a vibrant part of the world. In the past year some of the best food I have eaten has been in the same ilk. After Berber & Q helped us understand the versatility of tahini, so Le Bab made us reconsider the common kebab. My meal there with E was so simple, tasty and great value plus a chance to rediscover the whole Kingly Court area which is a hidden gem just above Regent Street. Then came my favourite of them all: Oklava. This small team have a great heritage behind all of them and have created the most wonderful place to eat modern Turkish food. It was everything I wanted it to be and much more. Supper with E again and a great discovery. We tried way too many dishes. E adored the crispy pomegranate glazed lamb breast with yogurt. I loved the chilli roast cauliflower but the surprise for me was the Carrot Borani. It was beautiful to look at and incredible to eat. Complemented with some really interesting Turkish wines it encapsulates this new style of eating. Overall this up to date take on such an ancient cuisine is really encapsulating where food is going. It is adventurous, colourful, and tasty. It is also good value, is more vegetarian focused and creates a relaxed, often communal way of eating that is not a formulated concept, rather a modern way of eating. Cutlery is optional. Flavours are powerful. Eating is a great experience. Next on the list? The Barbary. Sister the The Palomar. Bring it on! It’s always interesting in my field of work to see how things cluster together to point you in a certain direction. Last week was my birthday and I was lucky enough to be taken to one of the last days of the @tahinirest: a pop up established by an old colleague of ours, Josh. He took a big step last year taking his family on the most incredible journey travelling around Europe and the Middle East and was so inspired by the Israeli food in particular that he created a temporary restaurant offer on his return. Over a really fabulous brunch, we discussed what it was about the food in Israel that had captured his imagination. He talked about the balance of fresh food, spices, and flavours: a combination of which he hadn’t seen much of back in London. In particular we chatted about to make labneh and how tahini really was most amazing almost undiscovered product over here. Whilst we know it to be a key ingredient in hummus, he told us how versatile it was and how it could be used in so many, both savoury and sweet ways. Apparently Yotam Ottolenghi had only that week declared it one of the best kept secrets that was about to emerge and I went away still relishing the combination that had been served that day. Fast forward only 4 days later and I was also being treated for my birthday – well a girl has a right to elongate her celebrations! 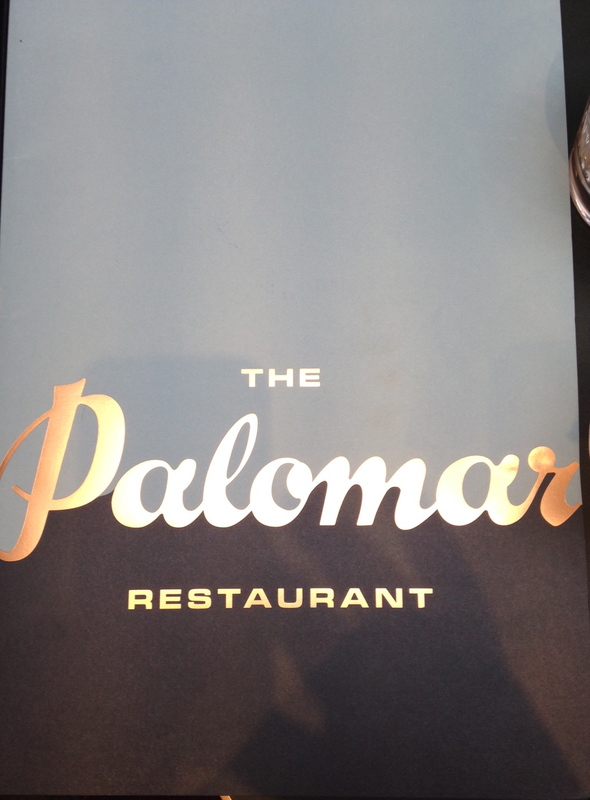 This time, it was a chance to try The Palomar. This new eaterie has been getting rave reviews and whilst they are new to us, the Jerusalem food scene is only too familiar with this team. The Machneyuda Group now boast five outlets headed by the trendiest of Jerusalem restaurants and inspired by Iron Chef Assaf Granit and his two other Exec chefs: Uri Navon and Yossi Elad who combine Palestinian/Israeli food with European influences to huge success. When something is so well reviewed, I can’t help wondering whether it is just hype and in so many cases the actual experience is never quite so good. In the case of the Palomar, it is all true. As Mr Jones said – they had me at the bread. Pastry chef Yael really has brought a great intro to the meal with a must-have soft, buttery Yemeni pot baked bread. Yes, this is all about sharing although you might not want to let anyone else near the bread, but what we loved most was the use of those flavours that Josh had talked about just a few days earlier. The bread came with a grated tomato and silky tahini (what else) and parsnip crisps with labneh and chilli harissa. 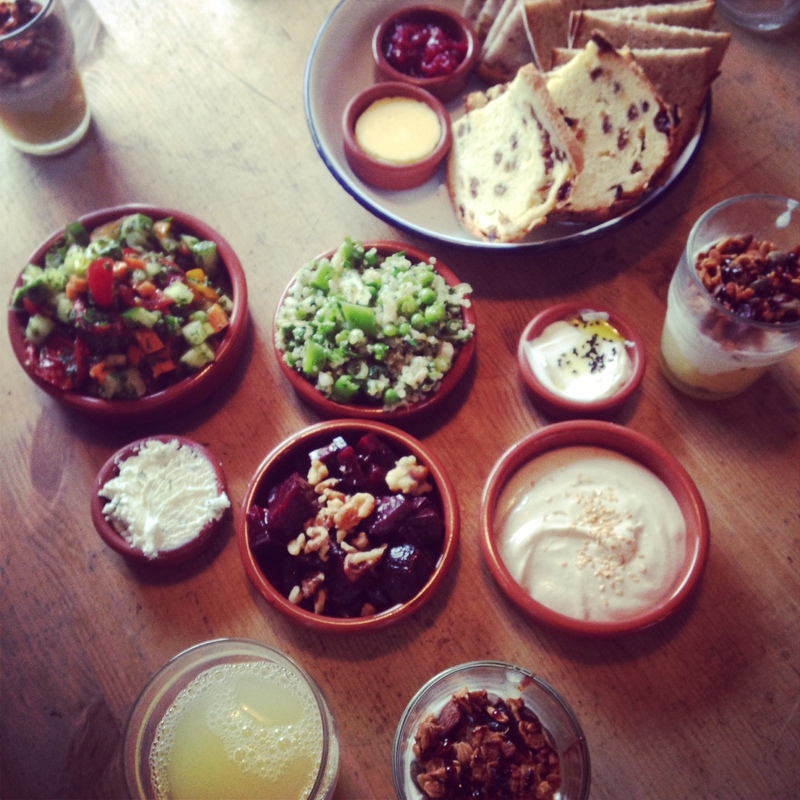 Early dishes from the raw section of the menu mixed fresh salads with herbs, spices and pulses with yogurt or homemade labneh dressings. The mains showcased the resident Josper grill to add a smokiness to the meat which balanced hot chilli and sweet fruits to create such tasty dishes. The chicken had crispy skin with succulent meat … the pork mixed sweet fruit and sour spice. The overall effect was just truly tasty plates of food and how often can you say that? The only disappointment was the announcement that the tahini ice cream was off the menu. I had really wanted to see that sweet application to better understand the aforementioned versatility. Shame. I will just have to go back and try out a few more dishes. Next time I will risk a walk in on the bar and partake in some of that chef/customer banter that has been written up. 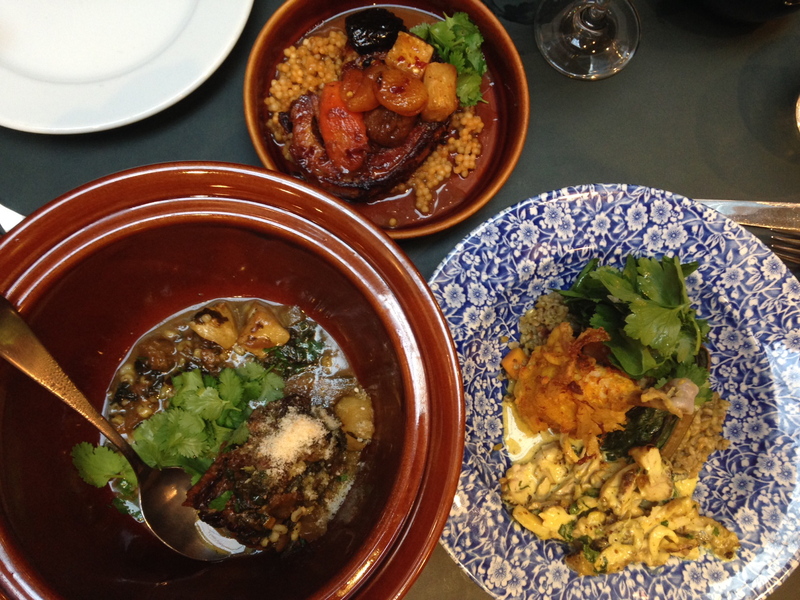 In light of the ever popular Ottolenghi and the much applauded Honey & Co., The Palomar just goes to prove that food of the Levant is the latest craze to try and I for one embrace it wholeheartedly. It is also well on the way to proving that tahini may well be the latest ingredient to look out for in the future.